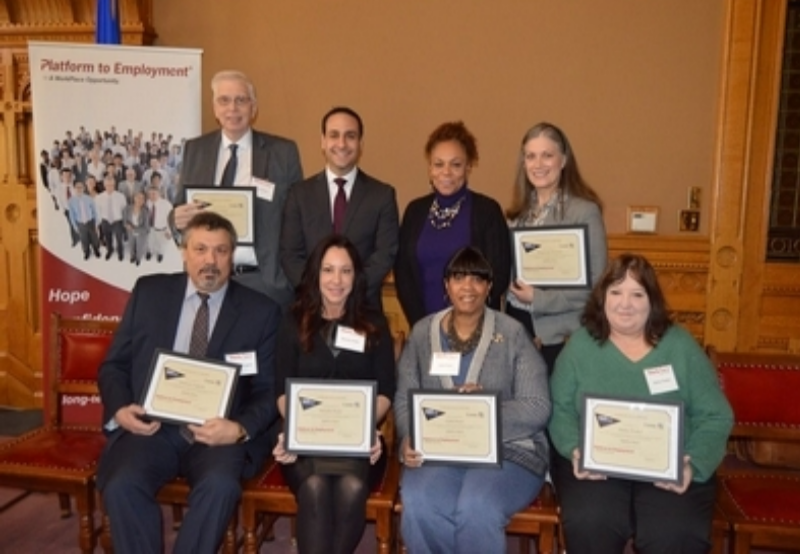 The WorkPlace held a statewide graduation of its Platform to Employment (P2E) program last Thursday at the State Capitol. Some 45 students from New Haven, Bridgeport and Hartford were recognized as graduates of the program, which since its inception has helped more than 1,200 long-term unemployed Connecticut residents find work. The P2E program has garnered national attention (including a 60 Minutes segment featuring Workplace CEO Joseph Carbone) for its effectiveness in fostering empowerment and economic self-sufficiency among its target population. Funded through the state’s Department of Labor, P2E begins with a five-week orientation during which participants confront barriers to employment through coaching, skills assessments, career readiness workshops and programs to rebuild confidence and enhance employability. P2E covers the cost of wages during a trial period where employers can evaluate job candidates for permanent positions within their organizations. For employers, this provides a risk-free assessment period with the aim of hiring skilled and motivated new employees. Politicos such as Lt. Gov. Susan Bysiewicz and State Sen. Martin Looney (D-11) were on hand to offer words of congratulations and encouragement to the new graduates. Since its inception, P2E boasts of a success rate of more than 80 percent of participants returning to work at an average wage of $51,505, according to WorkPlace officials. And as Connecticut’s population continues to age, so too does the average age of P2E participants. In 2018 76 percent of P2E participants were age 50 or older.